This compelling children’s book has so much going for it that the best advice is to read it. In fact, that’s what the sixth grade class does in our Waldorf school, and I hope parents read along. 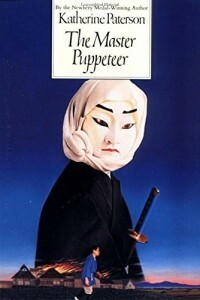 The story takes place in old Japan, set in the classic art of Bunraku, or puppetry. So along with a compelling story, this children’s book offers a look into another culture and its history. The two themes that stand out for me in the book are friendship, and father/son relationships. The two main characters in the story both have difficult relationships with their father, relationships which wind up shaping their destinies. And yet, despite the difficulties, we discover there is a true bond of love in each of those father-son pairs. The aspect of friendship in this children’s book goes beyond our typical superficial look at bff. Rather, friendship here is almost a code of honor, including risking one’s life and limb, literally, for the sake of a promise to a friend. This is important stuff. While it’s helpful to know more about the Japanese culture before reading it, the themes are useful for discussion and uncovering. For example, the humiliation described above might not appear so important in contemporary Western culture, but the fact that a boy had an outspoken opinion in front of his elders was quite serious at that time in Japan, and perhaps even today. This is a valuable children’s book, that adds to the study of other cultures while bringing great themes to life.